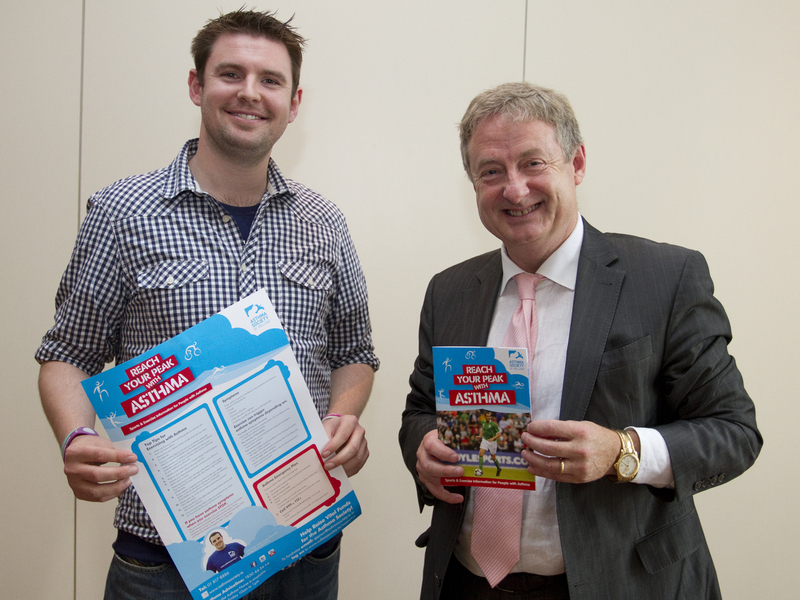 Louis Coyne, Asthma Society of Ireland Research and Education Officer and Professor Stephen Lane pictured at the Reach Your Peak launch. 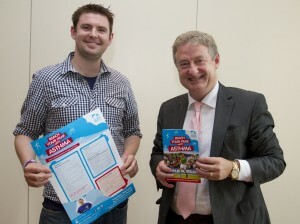 The Asthma Society of Ireland launched a new toolkit, Reach Your Peak with Asthma to help and encourage people with asthma to take part in sports and exercise. The launch took place on Saturday 12th of May as the Asthma Society hosted the AGM of EFA, the European Federation for asthma and allergy patients, held in Dublin. Asthma patients from a variety of sporting fields and clubs were invited to join member delegates from more than 15 countries across Europe, where they were given expert information on exercising with asthma and a copy of the Reach Your Peak with Asthma pack. Reach Your Peak with Asthma comprises three useful tools, an information booklet, poster and wallet card, to help adults and children with asthma exercise safely. The booklet contains comprehensive information on all aspects of exercising with asthma including the steps to take before you exercise, asthma information for coaches and PE teachers and a sport specific guide on exercising with asthma. The poster is designed to be displayed in schools and sports clubs to give pupils, members, teachers and coaches, access to important information on exercising with asthma and what to do in an asthma attack. The wallet card is a vital personal asthma tool which is easy to carry in your pocket or gym bag and contains ‘Top Tips for Exercising with Asthma’ and an Asthma Emergency Plan detailing what to do in an asthma attack. To order your Reach Your Peak with Asthma pack or to speak confidentially with an asthma nurse, call 1850 44 54 64. Alternatively the Reach Your Peak with Asthma booklet, poster and wallet card are available for free download at www.asthmasociety.ie. Asthma is an inflammatory condition that affects the airways – the small tubes that carry the air in and out of the lungs. People with asthma have airways that are extra sensitive to substances (or triggers) which irritate them. Common triggers include cold and flu, cigarette smoke, exercise and allergic responses to pollen, furry or feathery animals or house-dust mites. When the airways come into contact with an asthma trigger, the muscle around the walls of the airways tighten so that the airways become narrower. The lining of the airways swell and produce a sticky mucus. As the airways narrow, it becomes difficult for the air to move in and out. That is why people with asthma wheeze and find breathing difficult. Whilst there is no cure, asthma can be controlled by avoiding ‘triggers’ and by the use of ‘reliever’ and ‘controller’ medication. Relievers are medicines that people with asthma take immediately when asthma symptoms appear. Controllers help calm the airways and stop them from being so sensitive. Talk to your GP or asthma nurse about which treatment is most suitable for you. The Asthma Society of Ireland is the national charity representing the more than 470,000 adults and children with asthma in Ireland. We support asthma patient and their families by providing a wide rage of high quality information and education services free of charge. We raise awareness about asthma and the importance of good asthma management with patient and the wider public, and actively engage with healthcare professionals, government departments and third party organisations to keep asthma high on the agenda. The Asthma Society also supports research and innovative projects which investigate the causes and treatment of asthma. The Asthma Society’s goal is to optimise asthma control for all patient through services, awareness, advocacy, research and development; enabling all patients to enjoy optimal asthma control and quality of life. The European Federation of Allergy and Airways Diseases Patients Associations (EFA) was founded in 1991. There are over 100 million people with asthma, allergy and chronic obstructive pulmonary disease (COPD) in Europe. EFA is a European network of patient organisations that provides a forum for groups who share the same aims to effectively work together serving the needs and safeguarding the rights of patients and their carers. EFA’s office are located in Brussels and their current President is Irishwoman and Asthma Society of Ireland Board Member, Breda Flood.